It all started in the back yard of a residence directly across the historic Woodlawn Cemetery on South Fifth street in Quincy, Illinois. J.W. Madison loved kids and bicycles. First as a hobby and then to supplement his family`s income during some tough times he often found himself cobbling together some well-used bicycles for the neighborhood kids to ride. When the house the Madison`s were renting went up for sale they needed to find another place to live. A duplex at 912-914 S 8th street was available and allowed them to stay in the neighborhood. They could live on one side and have J.W.`s dream bicycle shop on the other. So in 1947 the Madison Bicycle Shop became a reality. After a while J.W. saw the need to expand the workforce and the enterprise, with the addition of Carl (Odie) Madison, became a father and son operation. A decade went by without much change. The younger Madison became very involved in the Boy Scout program and eventually went on lead fifty-four boys on to the rank of Eagle Scout from the storied Troop 28 of Union Methodist Church. In the 1950`s J.W. found that he was afflicted with Parkinson`s disease which finally force him from his daily activities at the bicycle shop. In 1964 one of Odie Madison`s scouts started coming down to the shop to help him out. And at 13-years of age Greg Davis began his career in bicycles. First through junior high, then high school and finally through four years at Quincy College, Greg would attend school and then head to the bike shop to see what jobs were waiting for him. After Greg`s graduation from college he became a partner. In 1967 the store started selling new bicycles with Raleigh and Robin Hoods becoming their first lines. Others that followed through the years included Liberty, Vista, Dawes, Schwinn, Fuji, Jamis, Nishiki, Columbia, Motobecane, Red Line, Torker, Thruster, Roger DeCoster, Dyno, GT, Giant and Trek bicycles. In the late 1970`s the property directly north of the shop to the corner of 8th & Jefferson became available. This set the stage for an expansion that wouldn`t occur until many years later. It was also during this time that the elder Madisons moved from the duplex which allowed the bicycle shop to double in size. Bicycling continued to gain in popularity and the business continued to grow. In the mid-1980s there was some remodeling done to the existing building. A new furnace and air-conditioning system was installed. Walls were moved, carpeting was put in place and a new aluminum and glass front was added to the building. Odie and shop dog Mugsy! That was pretty much the extent of capital improvements for quite some time. It always amazed people how much business was conducted out of a 2100 square foot building which included only 768 square feet of selling space! No summary of Madison Bicycle Shop history would be complete without mention of the many “shop dogs” that graced the place. For those of you who have been with us for enough years see how many you can remember. We won`t count the dogs the Madison family had around the house, just those who could regularly be found helping out at the shop. First, there was Rusty, a mixed breed beagle and Irish Setter (we think). We got him from the pound in the early 70s. A brother and sister combo of Shih Tzu’s joined us in the late 1980s, named Pasha and Stormy. Stormy was the first dog to regularly be found lying on the old showcase when customers came in to do business. Peeko was next. A big blonde Pekingese who we wouldn`t trust on the counter; talk too nice to him and he would snap at you. Chigger, a coal black Pekingese was next…also a counter dog, who many of you may remember went blind but still enjoyed her interaction with customers. 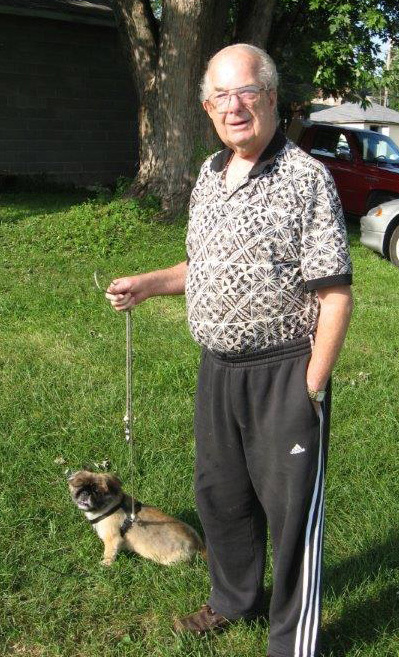 Rounding out the Pekingese counter-dogs was Muggs, who was with us until Thanksgiving 2011. The shop had always been by-and-large a two-man show with occasional summer help. And although Ryan Hildebrand grew up in the neighborhood and was no stranger to the shop his official employment didn`t begin until April of 1999. Odie, and Muggs, were then able to take their positions as story teller and public relations. With business continuing to expand the business was caught between two worlds. In deference to Odie the need for a new facility was put on the back burner. What we had is what he was used to. The complexities of any move to modernize would not be particularly welcomed, or in his view, not even necessary. One of the historical reasons our shop outlasted so many startups over the years is that we kept fixed costs to a minimum and were able to weather the off-seasons when little business was available. On the other hand we were dealers for the Trek Bicycle Company, established in 1979, and which grew very successfully in a relatively short time to be one of the biggest and most successful bicycle companies in the world. 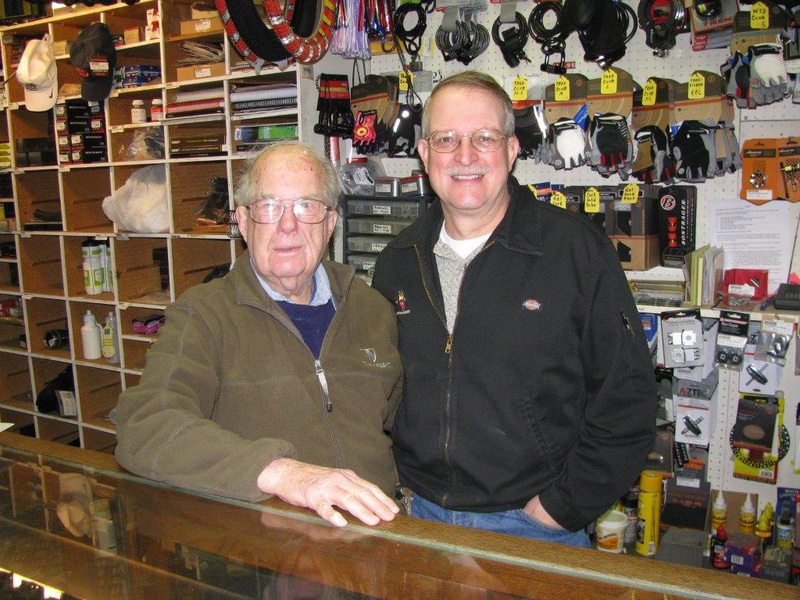 That, coupled with Ryan`s skills as a very gifted bicycle mechanic, provided reasons to expand, knowing that the Quincy area bicycle market has been underserved. And now, for the most difficult part of our history. Except for very few occasions Odie Madison was found minding the shop every day. His wheel truing (straightening) abilities were legend. His Great Depression experiences while growing up had a lasting influence on him as he would much rather repair and save an old part than sell a new one. Sometimes we would joke that we must be here to save the customer money as much as to repair their bicycles. He was honest, hard working and conscientious–pillars upon which this business was built. For 65 years bicycles, scouting and a die-hard affection for the Chicago Cubs defined Odie`s personal and professional interests. Then, at 87-years of age it was over. The end of an era. As a tribute to and in honor of the Madisons the new Madison & Davis Bicycle Shop is making its mark on the cycling community. A new building, yes. New opportunities and conveniences, yes. New philosophy, not hardly. We love bicycles and cyclists. Our modern 5,000 square foot store is totally devoted to improving our customers` shopping experience and expanding the cycling scene in the tri-state area.